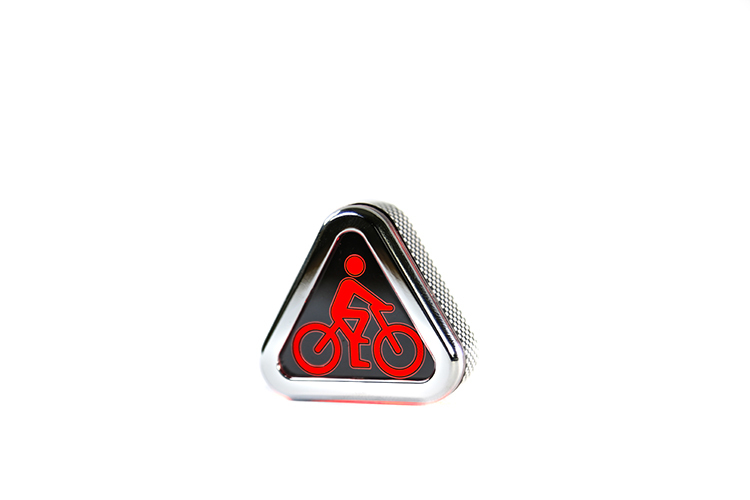 In addition to the cyclist symbol, the triangular shape is itself a recognisable warning shape. Triangular road signs are the ones that tell you to be really careful. Drivers know that triangular signs carry warnings and they respond instinctively to them. 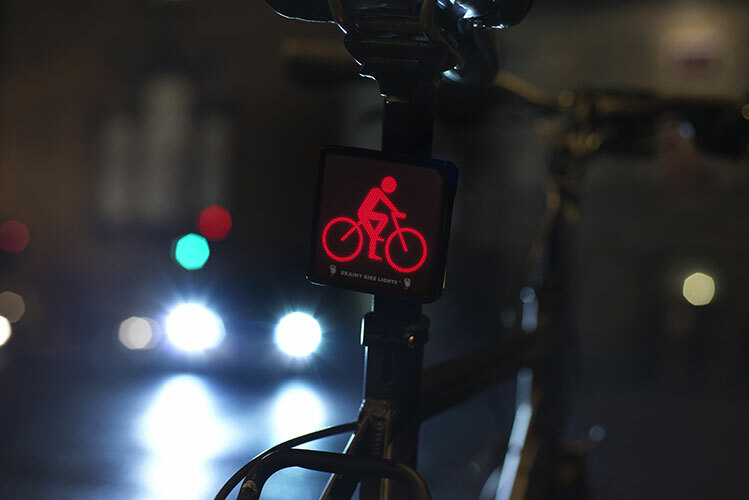 In addition to communicating the presence of cyclists on the road, the Triangular Symbol Lights will trigger a rapid warning reflex response in other road users. 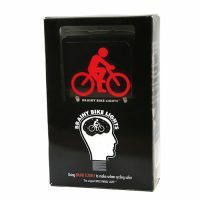 Comes with white mini USB cable which works with a PC, laptop or battery pack with a 5V output. It has chrome edges and carbon fibre effect. The light shines out crisply on the edges as well as in the symbol itself, the edge lighting allowing the symbol to be visible at acute angles. The fixing mechanism works on a sturdy pop in/pop out system as well as allowing you to turn it around within the strap so it’s orientated properly. The light conforms to CE FCC and RoHS certification and has tested water resistant to a solid IP3. The battery conforms to IEC 62133 certification. 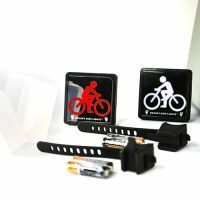 It’s easy to fix with an ultra flexible rubber strap which fits easily to bikes (handlebars, seatposts, etc etc), helmets and on backpacks and bags. Once the strap is attached the button on the back of the light simply pops in and fixes robustly. 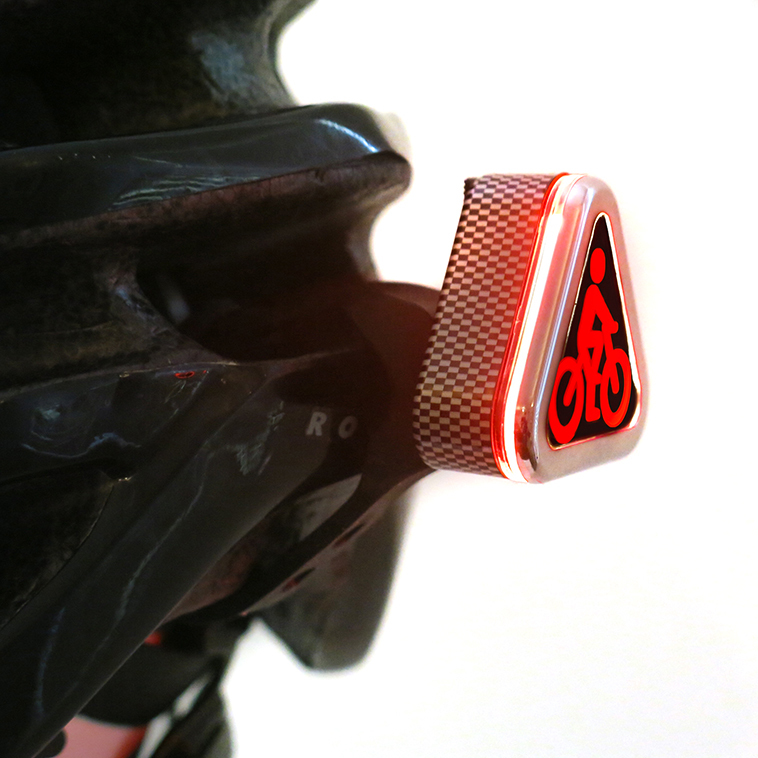 However, if you need to change the orientation of the cyclist symbol, just twist the light in the strap. When you take delivery of your triangular warning light it will be partially charged, simply so you can see that it works. You will need to charge it fully via the USB cable and a full initial charge will take 4 hours. 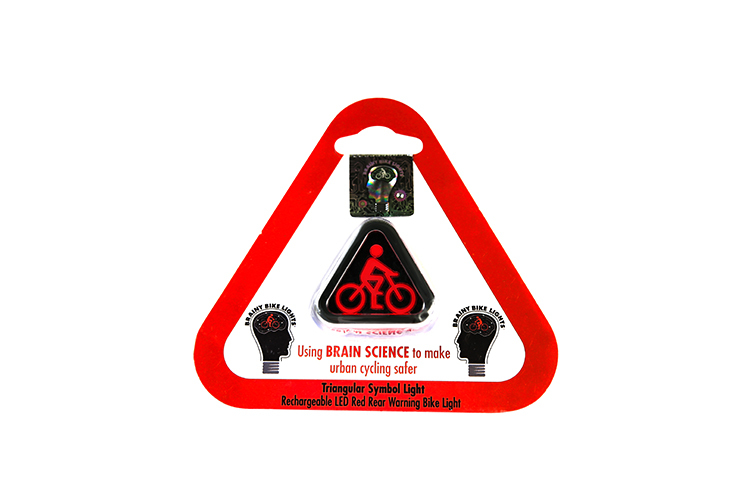 While the battery is charging a steady green LED light will show. This light will dim or disappear completely when the light is fully charged. If you don’t use your triangular warning light for a prolonged length of time we suggest you keep it partially charged, in a cool place (around 15 C) and recharge it fully before use. Do not overcharge the battery. 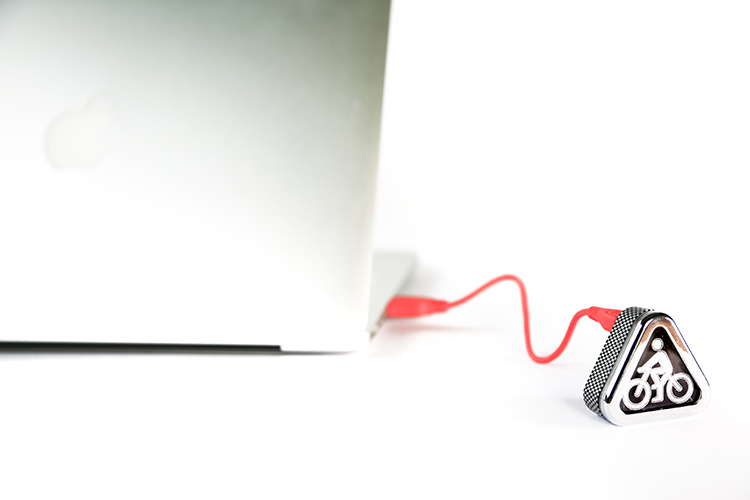 The 4 wire USB 2.0 cable provided is compatible with any USB port with a 5V output on a PC, laptop or battery pack. The integral lithium polymer battery is as compact and light as possible while still offering excellent runtimes. However all lithium batteries are sensitive and do not function well if it’s too cold (below -5 C) or too hot (over 35 C). 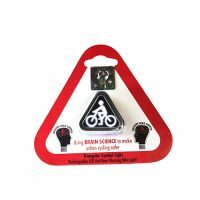 The triangular warning light is designed to attach not only to your bike – on the seatpost (it should fit most bikes up to a diameter of 50mm) or rear basket/bag rack – but also to your helmet or bag. The strap slots over the mushroom shaped button (match the oval of the hole in the strap to the oval of the mushroom head and slot in) and then fix the gripping hooks into the holes to achieve a tight grasp. The on/off switch is marked with a power symbol [Đ], press gently once to turn on, then press once more to reach each mode travelling in this order: static, flash, intense static and intense flash. Press once more to turn off. Please press very gently each time as excessive force will damage the unit. 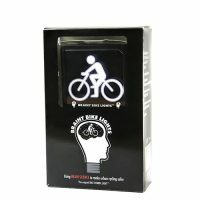 We recommend you remove the light from your bike if it is to be left outside/in a public space. 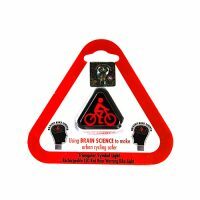 The rechargeable lithium ion battery IEC62133 in the triangular warning light is integral to the light. Do not attempt to open the triangular light to access the battery. If you do so you could risk injury, damage the electronics and you would void your product warranty.